Midway between Inverness and Aberdeen, one mile south of Dufftown on B9009 Tomintoul road. Speyside area. Established 1896 - Dufftown Golf Club is an 18 hole course set amongst the most breathtaking scenery in Speyside, the heart of the malt whisky country. Visitors return regularly to enjoy golf in this beautiful Banffshire setting where two of the holes (7th & 10th) feature in "Britain's 100 Extraordinary Golf Holes" by Geoff Harvey and Vanessa Strowger. Outings Welcome - All day golf plus meals for £28. All holes have different playing tactics due to the undulation of the course. From the first tee the course appears to climb for the first two holes, but once you are on the second green any inclines after that are not too noticeable. Your thoughts are taken up with the challenge the course sets and the superb scenery and the overall experience is of rolling fairways lined with heather and heath. The 7th hole is one of the shortest holes in Scotland at 67 yards off the visitors tee across a deep gully and has been described as a testing picturesque little hole. The 9th tee is one of the highest in the UK at 1,294 feet above sea level, while the stunning 10th tee stands at 1,213 feet with a magnificent view of the town and has a vertical drop of 339ft from tee to green. I am interessted in beiing a menber of the dufftown golfclub; please send me details about the fee and the inspripitions. My friend Mrs. Inga Bodenstein told me about your club. Please check out our website at www.dufftowngolfclub.com or email us at admin@dufftowngolfclub.com. We would be very happy to provide you will all the information you require. I am a native to Dufftown and have played at the course for about 5 years now. First off, it isn't easy. Every hole is sloped some way, either up and down or the fairway slopes down which can annoy if your ball slices as a bad bounce can land you in a different fairway. However that is the worst of the course and it isn't really all that bad, in fact it adds very well to the challenge! Careful use of the woods or the use of irons from the tee can help tame the slopes and judging the direction of the ball can be rewarding. The review at the beginning is right, the course is beautiful, the groundskeepers have it in excellent condition all the time and the surrounding scenery is gorgeous. It is a tenner a round which is brilliant value and the weather is never too hot because of the height above sea level. 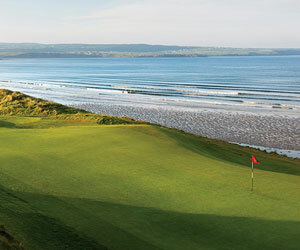 Hole ten has two claims to fame, the highest tee in Britain, and the biggest difference in height between tee and pin. It is a joy to play this course if you are on form, in fact I just scored my first round below a century yesterday! But, take heed of the beginning of the review because it can be tough.